If there’s one theme that’s marked steelhead fishing in Northern Michigan this fall it’s been low water. We had low water from mid October through Mid November, but we still had decent numbers of fish. Fortunately, when the rains came in mid and late November fresh fish came in. So far, this is the best run we’ve had since 2013. This is a great sign for our winter steelhead and years to come. I’ve also been impressed with the size of steelhead we’re seeing. 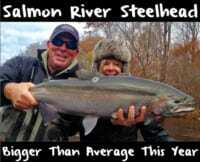 Most are adult steelhead are averaging eight to 12 pounds, which is similar to last year. On a typical day we’ve been hooking more than a dozen fish and landing six or more. Weather hasn’t affected our fishing this fall, but it’s going to start to soon. We had a few inches of snow a few weeks ago, which melted shortly after. This current storm brought up to a foot in some places and I’m expecting it to stick around. It looks like winter is finally here. Wintry conditions normally slow the bite, but steelhead remain plentiful for those willing to battle the cold. On the other hand they aren’t as aggressive when the water gets cold. You’re going to have to work harder for them. In Northern Michigan there’s steelhead available in the Manistee, Muskegon, Grand, Pere Marquette, White, Betsy, Platt, Boardman and many other smaller systems. It’s no secret where steelhead are. Regardless of where I’ll be fishing we target them the same. In the winter we downsize. Instead of running seven to 10 egg sacks, we’ll run more three to six egg bags. In the smaller rivers I’ll use eight-pound fluorocarbon leaders because there’s more structure in them. However, in larger systems like the Manistee and Muskegon, I’ll drop down to six-pound test because there’s more open water. Depth becomes important. Make sure you find bottom in every hole because the steelhead tend to hug the bottom in the winter. I’m fishing with spawn bags exclusively. White and chartreuse bags are my go to colors. As I mentioned above in the winter we’ll run three to six salmon eggs in a bag and it’s important to keep a smaller profile. All of my eggs are cured in Natural BorX O Fire, which has become standard in the region. Meanwhile, in a few weeks I’ll start using some jigs and minnows, too. I’ll be focusing on deeper holes, the same holes that we target salmon in. Once the water temperature drops the fish are bunkered down in the deeper holes. They’ll avoid the fast moving water. Editor’s Note: Kyle McClelland is based in Northern Michigan and operates XXL Chrome Chasing. 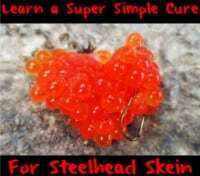 For more info on his guided Northern Michigan steelhead trips please visit https://www.facebook.com/XxlChromeChasing.